I continue to see posts from RV owners saying they have "Rubber" valves. This even though most rubber valves are only rated for 65 psi cold. There are some rubber valves rated for 80 and even some rated for 100 psi but these are not interchangeable. How can you tell if you have the correct rubber valve for your application without dismounting the tires? A quick examination should give you an idea of what you have. First unscrew the cap. See if the the only metal you see is the threaded part right under the cap. This is just over 3/8" long. This valve is usually about 1-1/4 long outside the wheel. Is designed for a hole in the wheel of 0.453 and is rated at 65 PSI Max Cold inflation. It is either a 600HP series LIKE THIS which is rated for 80 psi Max Cold inflation or a 801HP series rated for 100psi Maximum Cold inflation. NOTE these are NOT interchangeable as the 600 is designed for a rim hole of 0.453" while the 801 needs a hole diameter of 0.625". Now even if your cold tire pressure does not exceed the rated capacity for the valve you have I strongly suggest you consider switching to a bolt in metal valve with the appropriate rim hole size as if you run valve extenders or hoses or external TPMS you are probably applying more side load to the valve that it was initially designed to accept. Also you should be running metal valve caps not the cheap plastic ones that probably were OE for if the valve core leaks due to a bit of dirt the metal cap can hold much more pressure than the plastic one. NOTE if still in doubt you should have the valves inspected by a tire dealer. 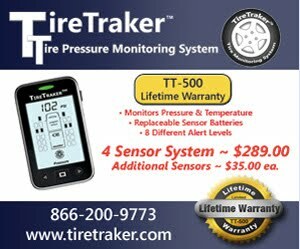 Call and ask if they have a Technician ASE Certified on tire inspection. If not, select another dealer. Recently I was asked to clarify some information an RV owner discovered as he did some research. What we see here is an error that is easy to make. Even for the more experienced RV owner. 215/75R17.5 LR-J tire that came on a 5th wheel trailer. He had confirmed the load capacity of the tires at their max rated inflation and said they could handle the load on his 8,000# axles when inflated to the placard inflation of 120 psi. His question was about the max speed rating of the tires. He consulted the Michelin Truck Tire Data Book and found that the subject tires were intended for Low Platform Trailer application. In fact the brochure for his tires even identified the maximum speed rating for his tires as 62 mph. He wanted to know if the maximum speed rating had been waved for RV application, and if it had what was the new speed limit. He found a statement from the Tire & Rim Association that specifically stating that when a tire had a speed rating below 65 mph it could not be manipulated (increased) with adjustments in inflation and load. He also found a Michelin truck tire service manual specifically saying that low bed trailer tires like the XTA, cannot have their speed increased. Despite all this information he wanted to know how to work out the adjustments needed to allow a higher speed limit for the RV and could I please help him understand what he felt was confusing information given that the RV manufacturer had selected these tires for his trailer. I had to tell him that in my opinion there was no way the speed limit could be adjusted. I pointed out that his error was in looking for information in data books and manuals of different type tires such as Truck Tires, RV tires and Low Platform trailer tires and assuming that since his tires were sort of like truck trailer tires and looked like tires he has seen on other large 5th wheel trailers, he could pick and choose which information applied to his specific tires. 1. Not all RV manufacturers pay a lot of attention to proper tire selection for the application. 2. When doing research on tire type and specific operation limitations you need to look only at the literature for your specific tire if such literature is available from your tire manufacturer. 3. 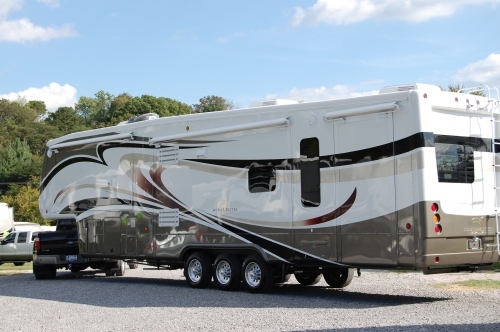 You cannot depend on the RV dealership to warn you about the real quality or limits of some components of your RV. You need to take responsibility for what you purchase. i.e. Let the buyer be aware. Speed ratings are like the “Red Line” for your car, truck or motorhome engine. While it is possible to exceed the max speed rating of a tire just as it is possible to exceed the rev limit and run your engine in the red zone, I think we all understand that if we do run our engine that fast we are pushing the odds. In the same manner if your tires are rated for 65 mph max you might be able to run faster for a short time but you are consuming the finite limit of the tire structure and simply slowing down does not repair the microscopic damage you have done to the internal structure of the tire. You should not be surprised if you blow your tire just as you would not be surprised if you blow your engine after running in the red zone for engine speed.